Testicular torsion is a twisting of the testicles and the spermatic cord (the structure extending from the groin to the testes that contains nerves, ducts, and blood vessels). The torsion causes decreased blood flow to the testes, essentially strangling them of oxygen and nutrients. This is a painful problem that usually occurs in boys age 10 and older. While it generally occurs in adolescent boys, it may also occur during fetal development or shortly after a baby is born. In preadolescent and adolescent boys, torsion occurs primarily from incomplete attachment of the testes within the scrotum. This permits the testes to be more movable, allowing them to twist. Testicular torsion detected in the fetus results when development of the protective sac that surrounds the testicles within the scrotum does not attach to the scrotum internally. The cause of testicular torsion is unknown. However, some cases have been seen in fathers, sons, and brothers, suggesting a genetic component. What are the symptoms of testicular torsion? The symptoms of a testicular torsion may resemble other conditions or medical problems. Always consult your child's doctor for a diagnosis. How is testicular torsion diagnosed? Testicular torsion is usually diagnosed with a physical examination and a complete medical history. Your doctor may also perform an ultrasound, a noninvasive test that uses sound waves to make pictures of the kidney system to assess blood flow to the testicles. Some doctors may also take children with typical symptoms straight to the operating room for definitive treatment. It is imperative to make a prompt diagnosis because prolonged testicular torsion may cause irreversible damage to the testes. Other diagnostic tests may be included, but there is no test that can diagnose testicular torsion accurately all of the time. What is the treatment for testicular torsion? Testicular torsion usually requires immediate intervention. The severity of the torsion depends on if the testicle(s) is partially or completely twisted. The more twisted the testicle, the more urgent the intervention. To minimize long-term problems, intervention is usually required within six hours of symptoms. The majority of boys who develop testicular torsion will require prompt surgery to correct the problem. Surgery will help prevent torsion from occurring in the future. In some cases, manipulation by hand to untwist the torsion may be possible. 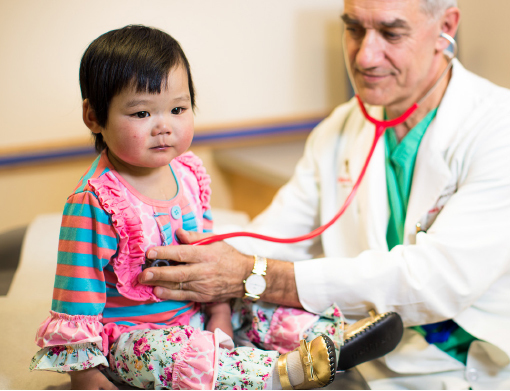 At Children’s National in Washington, D.C., our pediatric urologists provide comprehensive care for disorders affecting reproductive and urinary organs. The purpose of the two-year Pediatric Urology Post Residency Training Program is exclusively the education and training of the appointed trainee. Located within Prince George's County, the Upper Marlboro Outpatient Center offers a range of care by Children’s National experts. Like the rest of our outpatient centers in Maryland, Virginia and the District of Columbia, we provide specialty care for children of all ages at this location.